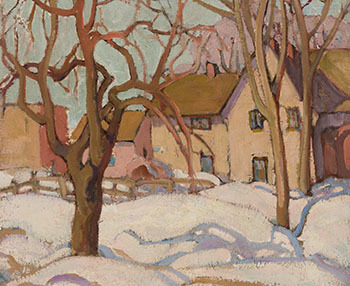 Mabel May was a founding member of Montreal’s Beaver Hall Group, which had a core group of women artists whose importance has been increasingly recognized in recent years. May’s early travels in Europe brought exposure to French Impressionism, and that influence can be seen here in her use of pastel highlights. May kept a studio in Montreal, and she painted in the summers at the family cottage in nearby Hudson. After the cottage was sold, she taught art and painted in Quebec’s Eastern Townships. 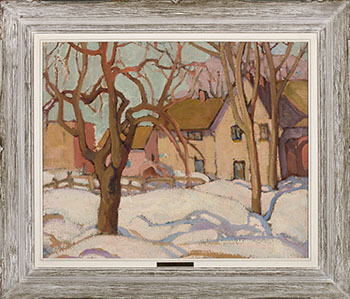 Farmhouse and Snow Shadows shows the influence of the Group of Seven - May was a friend of A.Y. Jackson and Edwin Holgate, and she participated in Group shows in 1928, 1930 and 1931. The motif of a screen of bare trees in front of the houses recalls compositions by A.J. Casson and the urban scenes of Lawren Harris. 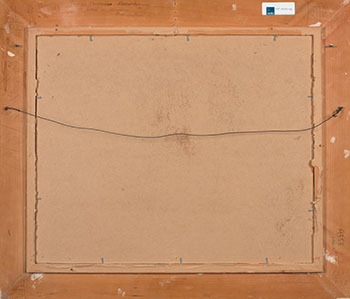 It is a superb canvas – May’s brushwork is bold, and her forms are solid and well defined. Her refined sense of rhythm in the smooth contours of the snow and the graceful arching of the bare branches and their shadows makes this a particularly fine composition by this important early modernist.